The first moments of the first meeting with a couple experiencing marital problems is always interesting. The preferred seating is for the couple to sit on the couch and I sit in one of the chairs. This allows me to look at them both with great ease as we have the conversation. Whenever I see a couple that has an issue with an aging parent or a struggling teenager, they always sit on the couch, close together, ready to tackle the problem. But when the issue is a marital issue, the seating arrangement is not always predictable. If they do sit on the couch, they might each hug the armrest on opposing ends. If the man has had an affair, the wife will quickly put a pillow between herself and her husband. If the wife has cheated, the man might cross his legs away from his wife. In many situations, one spouse will quickly move toward a chair. While the husband is expecting them to both sit on the couch, the wife will sit in a chair, leaving him confused as to where to sit. In the worst situations, neither of them sit on the couch. The each grab a chair and I sit down on the couch. In those situations, before a question is even asked, I know what the problem is. Notice in the first scenario, when a couple is seated side-by-side with nothing between them, their posture defines their perspective. There is a problem and they are united in wanting to attack the problem. 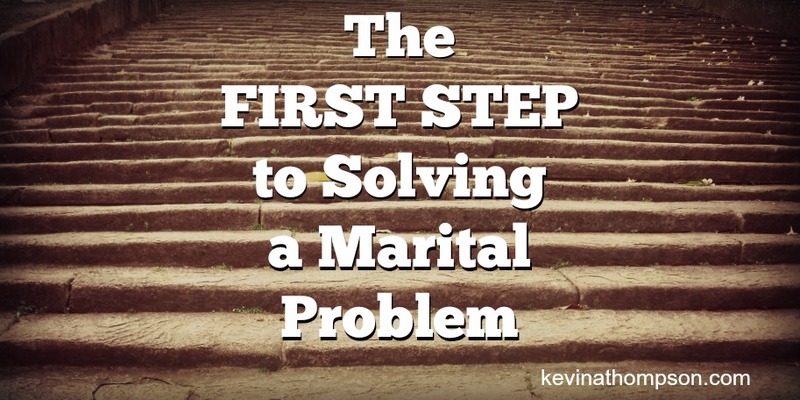 The first step in solving marital problems is to see the problem as an issue and not a person. It’s to take your spouse out of your line of sight for attack and to place an issue in their place. 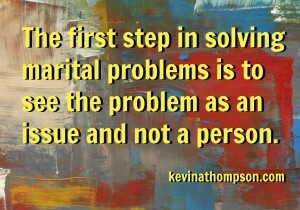 The first step to solving a marital problem is to see the problem as an issue and not a person. 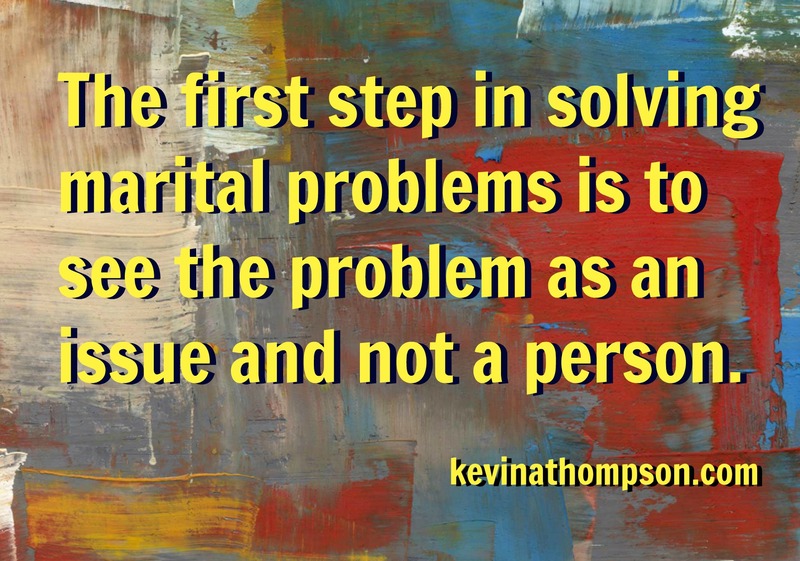 When a couple views the problem as an issue and not a person (specifically each other) progress can be made. Opinions are open. Ears are ready to listen. Hearts can be changed. A plan can be formed and possible solutions tried. Yet for as long as one or both spouses see the other person as the problem, progress is impossible. It’s not possible because one or both spouses will feel under attack, and when we are under attack we guard ourselves and attack others. If I feel you are attacking me, I will not listen, change, consider your opinion, repent, show humility, understand your point, or give you anything you might want. But, if you aren’t attacking me and do desire to attack an issue which I see as a problem, everything changes. Instead of viewing you as an enemy, I will see you as a friend. Every word or action will be seen as something for my good and not my harm. I will be open to listen, learn, understand, compromise, and change. If the problem is bad enough, I will do whatever it takes to attack the problem and anyone who is willing to stand beside me in that process is my friend. Everyone needs a partner in solving life’s problems. Marriage should be the guarantee that we will never face anything alone. Sadly, the one with whom we are called to fight with, we often find ourselves fighting against. Stop viewing your spouse as the problem. See them as a partner to solve the issue which is causing the problem. Well when my husband has cheated with multiple women, lied, manipulated, and emotionally abused me for at least half our marriage I have to say the person is the problem. The narcissistic person with no empathy or moral compass is the problem.